There is no doubt that the digital economy is an important market for the future, in particular the gaming industry. GGS alone have created more than 800 jobs in Hamburg, a trend that is set to continue upwards. 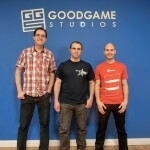 We are one of the biggest employers in Hamburg, and even politicians are recognizing the importance of Goodgame Studios in driving growth. 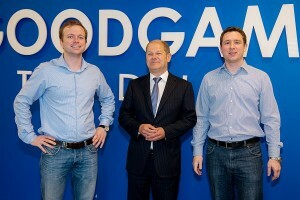 This is why we were visited last Tuesday by Olaf Scholz, First Mayor of Hamburg. He wanted to get to know the company and its founders, Dr. Kai and Dr. Christian Wawrzinek, and get a personal impression of the way we work and how we finance our growth. After the visit of the former Minister of Economics Dr. Philipp Rösler, we were honored to again have attracted the interest of a high-ranking politician. We are well aware of how important good networking and ongoing communication are. This is one of many reasons why we joined the BIU at the end of May. The Bundesverband Interaktive Unterhaltungssoftware (German Trade Association of Interactive Entertainment Software) represents the interests of many gaming companies in Germany. Along with other big companies such as Electronic Arts, Microsoft or Sony, we can make the economic and cultural significance of computer games clear to both important policy makers and the general public. We are already looking forward to a constructive and productive debate.